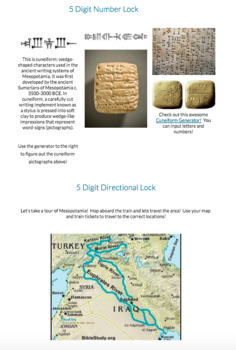 This product contains and Mesopotamia Breakout and a Mesopotamia Hyperdoc. Both items also sold separately. 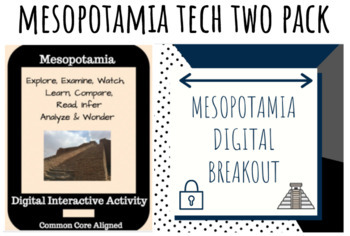 Looking for a digital breakout covering Mesopotamia? If so, then this is the document for you! All you need is connection to the internet! This breakout is on a Google site. Help! Some children visiting a museum have been held captive! They need your help to escape! If you can solve each puzzle and breakout in time, then the children will be set free! There is a reward of $10,000 if they get released in time! Can you save them? Are you looking for a way to make a topic more engaging, technological, and interactive? Well, then this is the product for you! 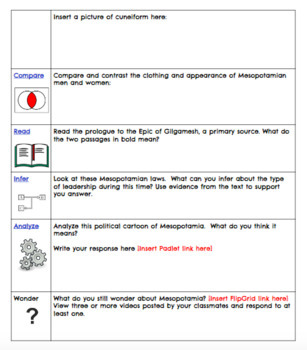 100% digital, this doc can be used to introduce or reinforce the study of Mesopotamia. 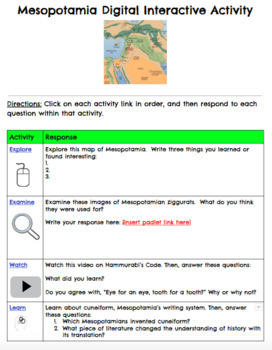 Product includes the link to the hyperdoc site and embedded within is a tracking sheet for each student to record their responses to each question. Must have internet access. Doc is web-based. Video link is from YouTube. It may be blocked by school filter. If so, show the video whole class. You may need to create a Padlet, FlipGrid and Answer Garden link for a few of the activities. Be sure your school district gives students access to documents from outside of your school district.